Tonight dinner, Chicken-Peanut Chow Mein, is fast to cook so it helps to have all the prep work done ahead of time to keep things moving. You could prepare the carrots and trim the snow peas a day or so ahead of time if you are short on time. While you wait for the pan for the chicken to heat up, the carrots, snow peas and noodles are cooked together in a pot of boiling water. The chicken gains quite a bit of flavor from being cooked in a strongly flavored dark sesame oil and a bit of soy sauce. When the chicken is done, freshly grated ginger and mushrooms are quickly sauteed in a dash more sesame oil. A flavorful sauce is added to the mushroom mixture made from soy sauce, chicken broth, oyster sauce with a bit of heat from crushed red pepper. 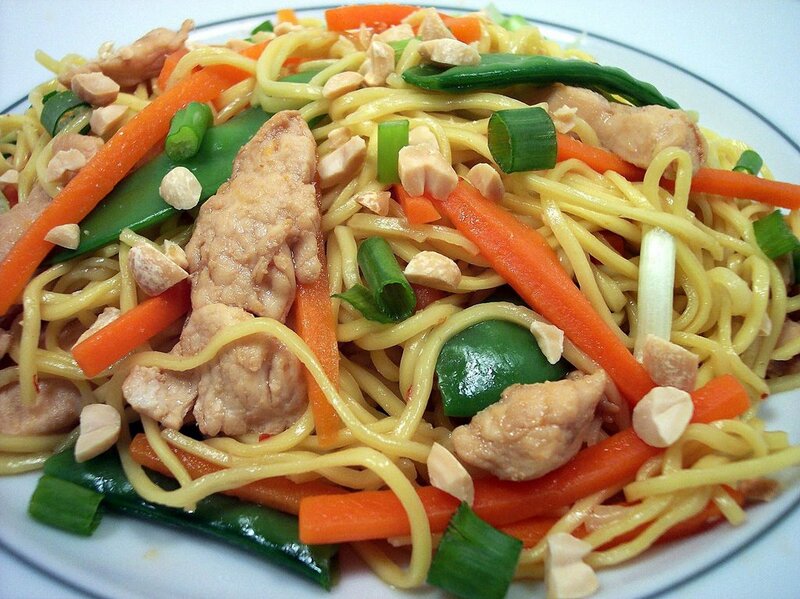 Everything is then mixed together and topped off with green onions and crunchy peanuts. This would be a perfect dish to cook with a friend and both be involved since it moves pretty fast. I mentioned on Sunday that we were going to be using a new herb in a sweet recipe. 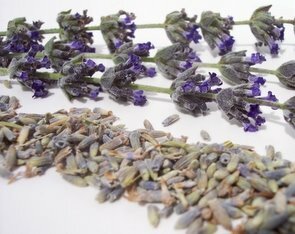 I have been drying some lavender blossoms from our plants and have been waiting for an excuse to use them. Orange zest also works its magic in both the sweet and savory dishes tonight. 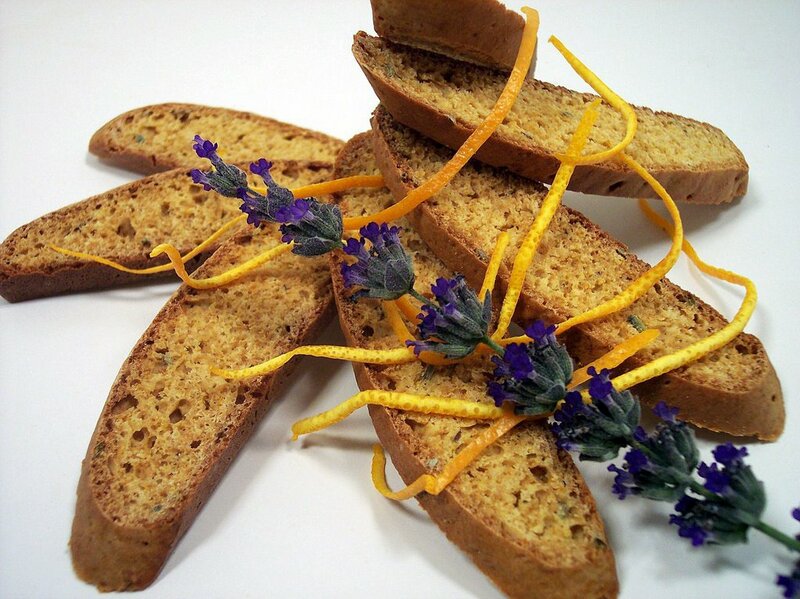 Today's sweet recipe, Lavender Honey Biscotti, has a blend of flavors that was fresh and new to us in biscotti. The dough was quite sticky, but using wet hands while stretching and flattening the dough made the job much easier. Eggs and honey brought such a rich and golden brown color to the crunchy slices. 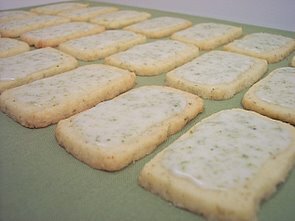 The dried lavender blossoms rendered such a brilliant aroma to these cookies that eventually filled the entire house as they cooled down. While the smell was strong, the flavor in them was a subtle floral accented with a zing from the fresh citrus zest. I'm not sure I could describe the flavor enough, but we thoroughly enjoyed these with a cup of tea tonight. Tonight's dinner was a light and clean dish that was perfect for the end of a springtime day. 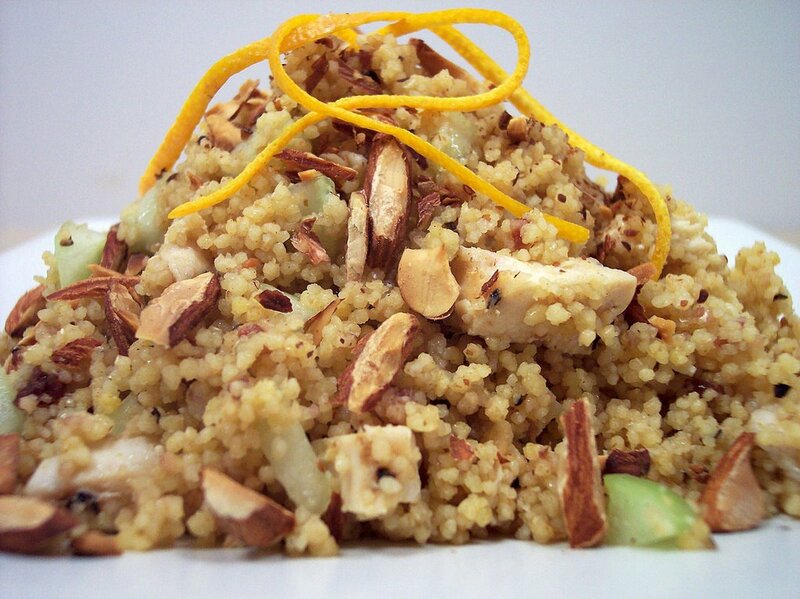 Orange-Scented Couscous Salad with Almonds, Cilantro, and Cucumber is coated in a invigorating dressing made from fresh orange juice, fresh lime juice, mustard and a bit of extra-virgin olive oil. 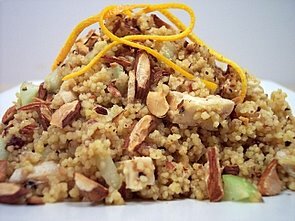 A mixture of fresh orange juice, ground coriander and cinnamon is used as the flavorful cooking liquid that infuses and peps up the whole wheat couscous rather than just using water alone. Dried cranberries, cucumber and diced cooked chicken bulk up the couscous to make it a main dish, and a sprinkling of toasted almonds brought a satisfying finish to the dish. 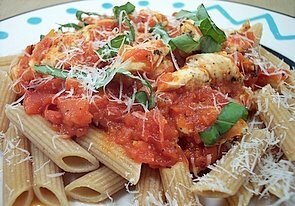 Tonight's dinner, Penne and Chicken Tenderloins with Spiced Tomato Sauce, used up a few pantry items that were itching to be used. Chunked chicken breasts are seasoned with ground fennel seeds, dried basil, coriander, salt and pepper. The chicken is browned and then removed to keep warm. Garlic is lightly sautéd in the same pan and a mixture of diced fire roasted tomatoes and white wine is mixed in. After the mixture is reduced until pretty thick, the chicken is added back and the sauce simmers to allow the the spices to permiate the sauce. The anise flavor from the fennel seeds brought a unique and complex taste to the sauce. This is then served over nutty whole wheat penne and topped with fresh basil ribbons along with a shower of freshy grated Parmigiano-Reggiano cheese. I served a toasted slice of the Walnut and Rosemary Loaf that we had left in the freezer. Lots to talk about today! Let's start off with the sweet side of things. Since today is Tuesday I had to get the Wednesday Treat Day goodies done for Jeff to bring into the office tomorrow. I have to admit, it was a test of will power to let these cool completely before trying to cut them to snag a bite! 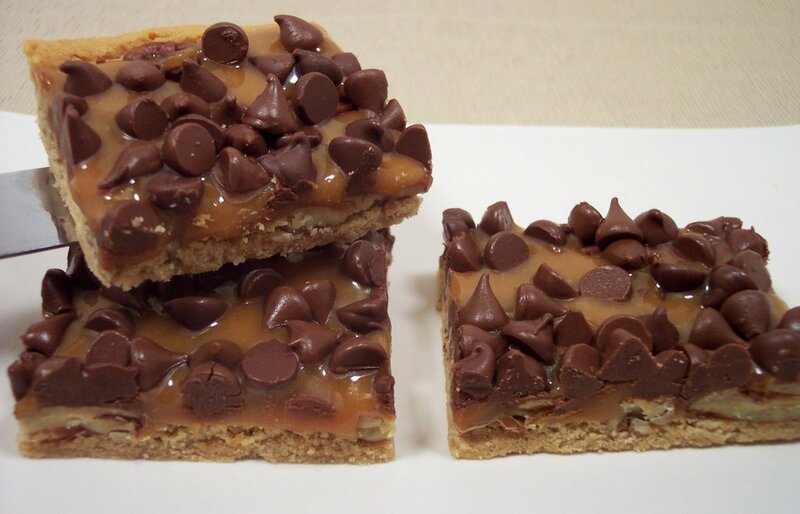 Nutty Peanut Butter Caramel Bars are a layered cookie that starts out with a dense base loaded with peanut butter flavor. Pecan halves are scattered over the top of the raw dough so they are allowed to get a toasty flavor while baking. 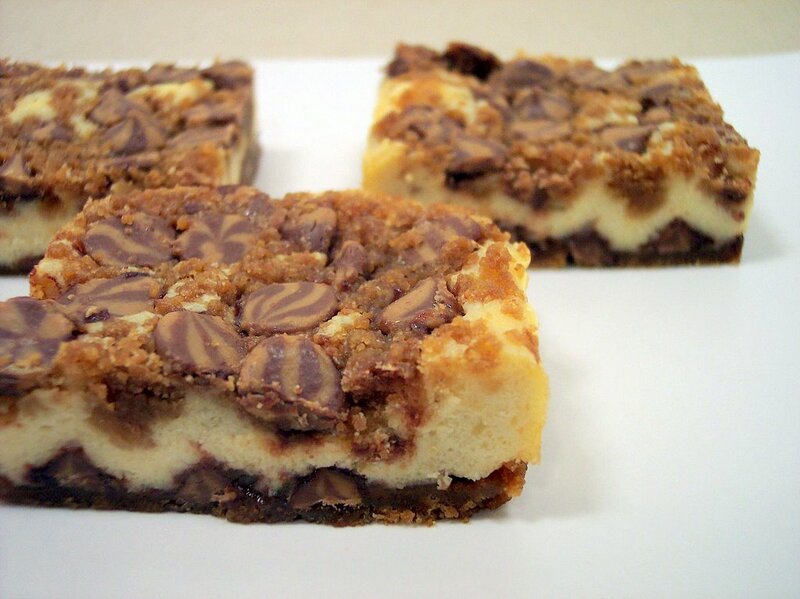 Smooth caramel is then drizzled on the baked cookie and seeps in between the pecans. 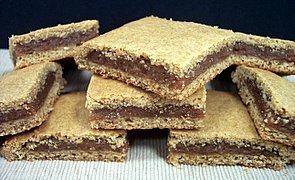 A combination of milk chocolate and bittersweet chips are scattered over the top. When the chips soften from the heat, you could use an off-set spatula and spread the melted chocolate over, but I left them as is so you could bite into chunks of chocolate. 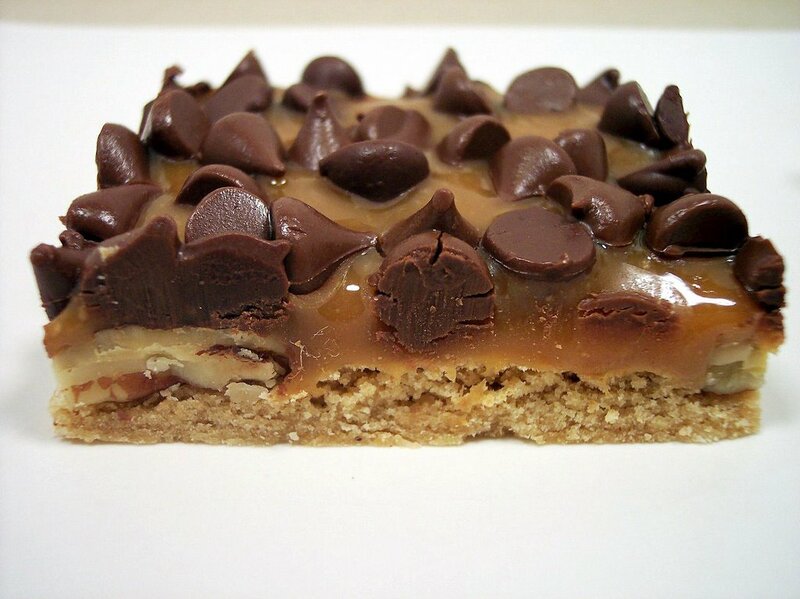 They are rich and decacdent bars, so cutting them into smallish pieces is very acceptable. 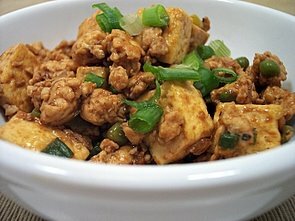 We are still relatively new to the world of tofu, so we tried out another recipe that looked like something we should like. For this recipe, Ground Turkey and Tofu, I cut turkey breasts into chunks and then with a couple pulses in the food processor we had ground turkey. The prices here for the ground version can get a litte crazy, so this saves us a bit of money by just doing it ourselves. I do this with chicken and pork too. Drained firm tofu is first chunked and browned in some olive oil which gives the outside a bit of a crust. Next, the ground turkey is browned and a sweet/spicy sauce is added made from hoisin, soy sauce, red pepper and garlic. The tofu is added back with some baby green peas sneaked in. This was good, but it could have been better I think. If the tofu would have absorbed more of the other flavors this could be excellent! I had no idea how to serve or what to make to go along with the above recipe so we went the simple route. 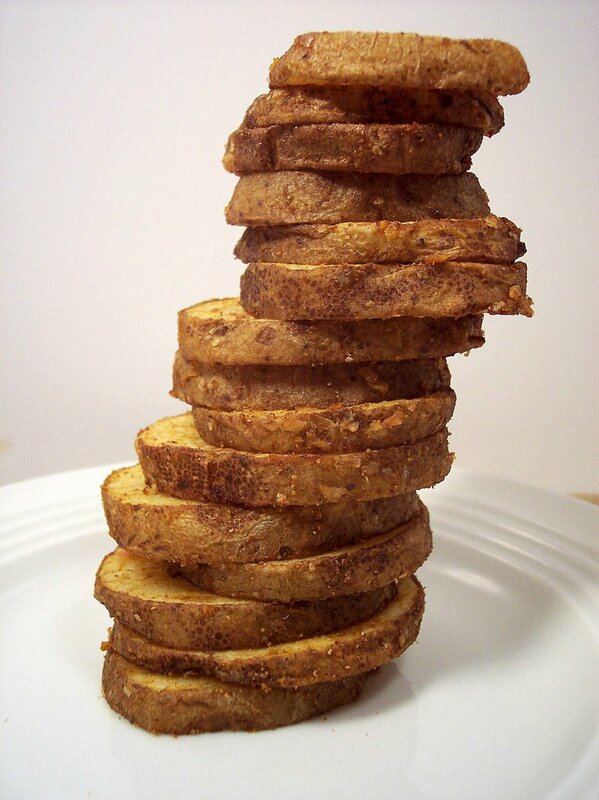 Cumin Roasted Potatoes are thick sliced russet potatoes coated in olive oil, cumin, red pepper and garlic. Roasting at a very high temperature allows them to get a slight crust while the inside remains moist and tender. The spices bring a bite with some smoky flavors. This was exceptionally tasty, quick and very easy to prepare. Okay, so there are a couple of vegetables that I've steered clear from using in the past as Jeff pronounced them as " I don't like them so don't bother using it." I would usually pass up a recipe or just leave that ingredient out if the dish wouldn't suffer, but tonight we threw caution to the wind and used something on the "don't like" list. I think he went a little wiggy from the name alone - Arborio Rice, Parmesan, and Green Pea Pancakes. These cakes take a bit of prep work, but they came out very good. Using a hot skillet and a bit of oil creates a crispy crust on the outside. The arborio rice makes these very creamy inside with just enough cheese and fresh flavor from the peas. An egg and a couple egg whites bind the mixture together to help keep the round shape as it cooks away. So, what did Jeff think? "Wow these are really good! So... about them peas... Maybe they are not so bad, but if anyone asks, I still don't like them!" My evil plan is working... trying to make him try all the stuff he "thinks" he hates - I wonder what we will try out next! I also made some Edamame Dumplings with a soy dipping sauce tonight. These could be made in advance and stored in the freezer before cooking if you like. Cooked edamame is pureed with some fresh lemon juice, toasted sesame oil and some spices to create a semi-smooth mixture. 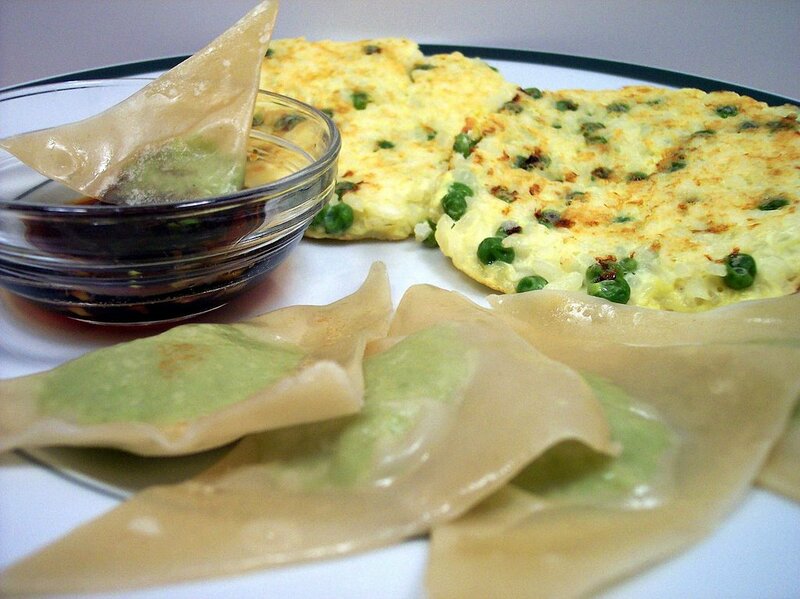 Wonton skins are the wrapper, so while it was easy to prepare, it just took awhile to get them all filled and shaped. These really take no time to cook and the sweet sauce was a nice accompaniment to the soft filling. I will have to remember this recipe when I need a fun and different appetizer since these can mostly done ahead of time. This week was a little slower in the kitchen with only 8 new recipes. The ones that stood out the most for us were the Lime-Glazed Cookies and Santa Fe Meat Loaf. Let's take a peak at one of the ingredients I have planned for later in the week. We planted some lavender a while ago and it has really started to take off. I started to dry some of the blossoms and plan to use them in a sweet recipe later in the week. I'm excited to try this as I have not used them before - the smell is quite intense! If you fancy some more herb viewing, make sure to check out Kalyn's Kitchen. The movie last night turned into a much more complex film that I thought it was going to be. While it was a little slow at times, the last half made up for it. 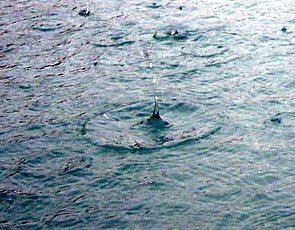 It was thrilling - the flashbacks were somewhat hard to follow in the beginning, but it was quite effective once you caught on. Tonight's movie from Netflix is a fun one - the new Chicken Little! I stayed up a little later and got the menu for the week ahead planned out - lots of new stuff again! I had some extra cream cheese to use up this morning so I went looking in the pantry to see what else I had on hand to use up. I found half a bag of some peanut butter and chocolate swirled chips along with some hearty graham crackers from Trader Joes. I used these ingredients to make some Chocolate and Peanut Butter Cheesecake Bars. I gave the graham crackers a quick whirl in the food processor, then mixed them with melted butter and some sugar to add a bit of sweetness. After forming a crust in the pan, some of the swirled chips are scattered on top for a surprise inside the bars. A sweetened cream cheese layer is spread on top enclosing the chips inside. Instead of making a thick base, we kept some of the graham cracker mixture to sprinkle on top of the unbaked bars along with some more of the swirled chips. This is then baked just until set, cooled to room temperature and then refrigerated to firm up the bars. The bars are very creamy, yet can be cut quite neatly. 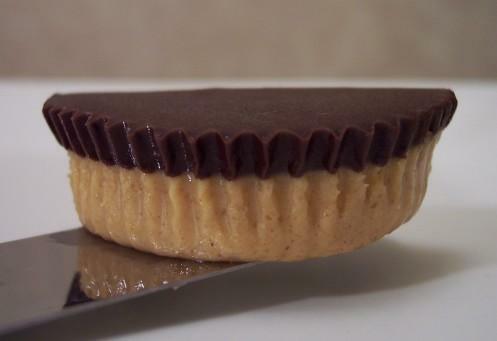 The chips keep their shape which gives bursts of chocolate and peanut butter in each bite. Tonight's movie from Netflix will be Proof with Gwyneth Paltrow and Anthony Hopkins. I have been going through the new magazines and pulled out a bunch of recipes, so the pile is growning again. I hope to get the menu set for this week tonight and have the list ready for shopping tomorow! Ahh... not too hot here - yet! What a nice spring time day in Phoenix today. We had the doors and windows open as it was sunny and 85 with a nice cool breeze that swept through the house all day. The dogs spent quite a bit of time outside today - of course I caught them rolling in the fresh cut grass ... with a white pup I knew I should have raked some of the clippings up! Anyway, on to tonight's dinner! Cheesy Beef-and-Rice Casserole has a base of jasmine rice that I cooked with half water half broth to infuse the rice with a bit of flavor. Mixed with the rice was a combination of sour cream, green onions, milk and a few dashes of Frank's red hot sauce. This is the bottom layer of the dish. Spread on top is lean ground sirlion that was browned with onions and smoky fire roasted red peppers. Spices and chunky tomatoes are added in to the beef and allowed to simmer for the flavors to come together. This thick mixture is poured over the rice and then topped with a blend of shredded mozarella, monterey jack and cheddar. Baked until the cheese is melted and the sides are bubbling - the result is a layer of rice that soaked up a bit of the extra liquid from the tomato sauce while the rest of the flavors melded together quite well. I was given some dried raspberries a couple weeks ago from Trader Joe's and I've been looking for something to use them in. I found a new quickbread recipe that orginially called for raisins, so I replaced them with the raspberries. Chocolate Raspberry Ginger Bread has a dark color and a subtle flavor from molasses and cocoa. 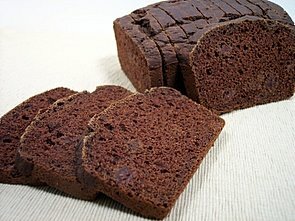 The moist bread is studded with chopped dried raspberries and has a deep chocolate taste from the cocoa powder. In this recipe, use natural rather than dutch-process cocoa, as the only leavining is from the baking soda. I think this would also be good with some of the raspberry flavored chips. I found the ginger to be pretty pronounced here, but I think it will mellow out and the bite will reduce overnight. Sometimes baked goods that have a lot of applesauce can be a little rubbery, this one has a couple tablespoons of canola oil that prevented this from happening. I also made some of the Cran-Apple Muffins today for Jeff to bring into work for a co-worker who's family was recently struck with a tradgey. Tonight's dinner was a pretty different combination of flavors and textures for us, but it was darn good! 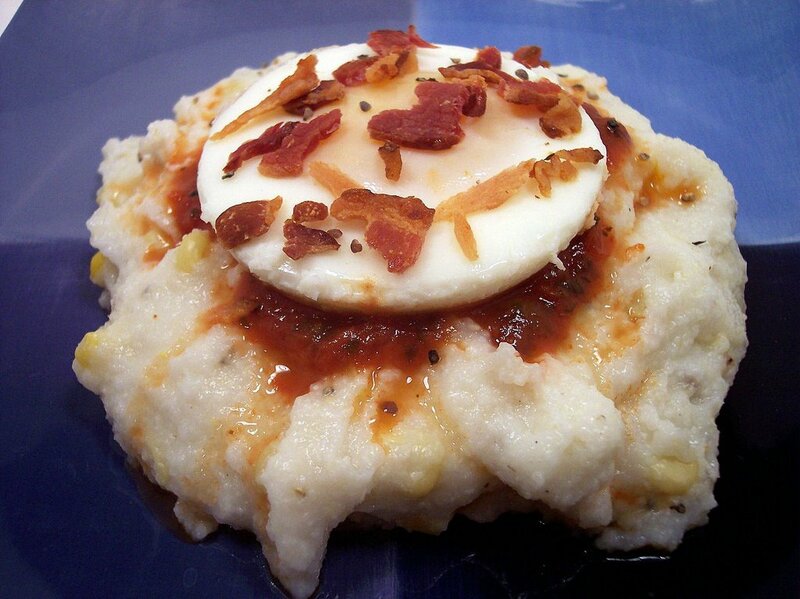 Poached Eggs with White Corn Polenta starts out by making a creamy polenta that is full of corn kernels. 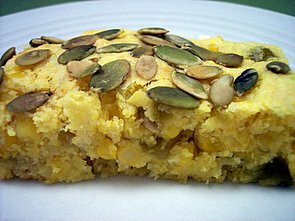 I used a fine-ground white cornmeal which ended up making the polenta pretty smooth. The flavor from the parmesan permeates the soft cornmeal and the butter brings a bit of needed richness. Since we had some leftover salsa from the other night, I topped the polenta with it and then added the poached eggs. A sprinkling of crisp bacon brings a saltiness and a bit of heat from cracked black pepper that finished the dish with a bang. We wanted to start off by saying a big Congratulations to Anna from Cookie Madness who won the $1 millon dollar grand prize at the Pillsbury Bake-Off! Well deserved! Tonight's dish for dinner was a quick stir-fry served over a brown and wild rice blend. Sesame Chicken Edamame Bowl starts out by sautéing garlic, lemongrass and fresh ginger in a mixture of canola and sesame seed oil. Diced chicken is then mixed in and allowed to get a golden color. Next, a mixture of edamame, edamame succotash and fresh diced red bell peppers are stirred in and brought up to temperature. 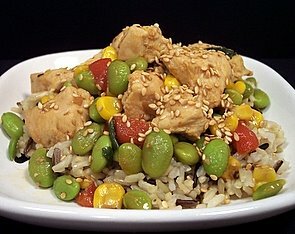 Soy sauce, mirin, sesame oil, and cornstarch are added to bring a thick flavorful coating to the chicken and vegetables. Finished with a sprinkling of salt, green onions and toasted sesame seeds, this meal hit the spot tonight. 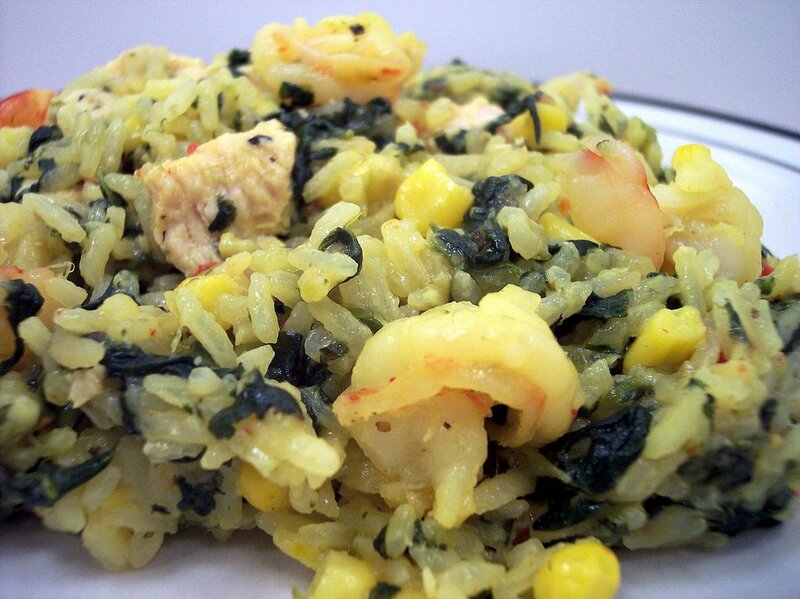 Fast, full of flavor and quite healthy - I can't wait for the leftovers tomorrow! I got the baking done for Wednesday Treat Day as usual today. I mentioned on Sunday that we were going to be using Limes in a cookie this time. We used copious amounts of zest and juice to flavor these cookies! Lime-Glazed Cookies are a simple cookie with few ingredients, but packs a ton of flavor. The soft dough is first formed into a log and then shaped into a long rectanguler brick shape. The dough is a buttery shortbread-like base speckled with lime zest. After a stint in the icebox to firm up, the dough can be easily sliced into cookies which are ready to bake or can be frozen until needed. The crisp cookies are topped with a sweet lime glaze that gently cuts through the richness of the base. A fresh citrus flavor zips around in your mouth that sticks around even after you reach the last bite. 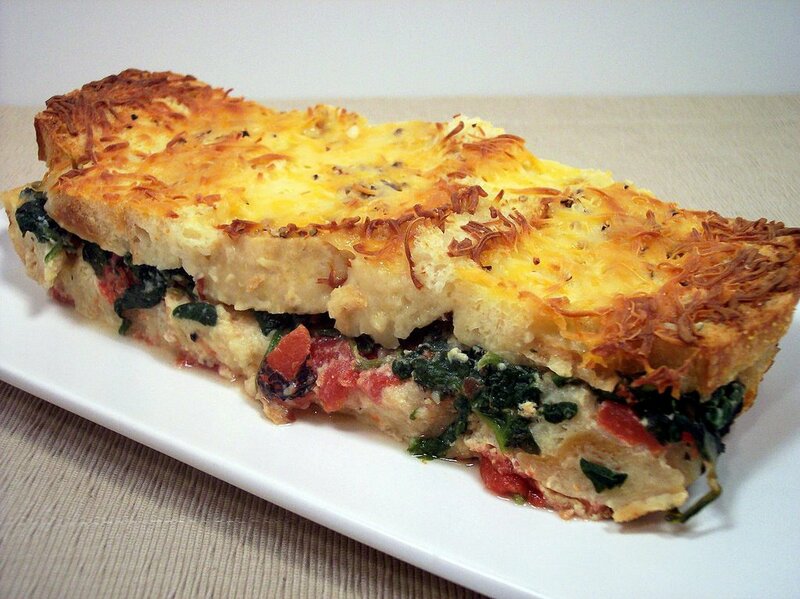 Dinner tonight, Spinach and Fire Roasted Tomato Strata, starts with a layer of chunky fire roasted tomatoes. Sliced sturdy bread is the next layer - I used a country style loaf that was quite dense so it could hold up to the wet ingredients. Another layer of the tomatoes are scattered over, followed by freshly sauteed spinach and garlic. More of the chewy bread is placed on top and an egg/milk mixture is poured over. Topped with a three cheese blend, this is set in the refrigerator to allow the dry bread to soak up the flavorful liquid. After being baked, the top takes on a crusty cheesebread type texture, with a firm egg filling underneath. I may not have drained the tomatoes enough as the first layer of bread was a bit soft, but the flavor was spot on. We have done a stuffed meatloaf before that we both really enjoyed. When I spotted the recipe for tonight's dinner, I was attracted to it because of how much we liked the other recipe. This one looked like it would be a bit more flavorful though. 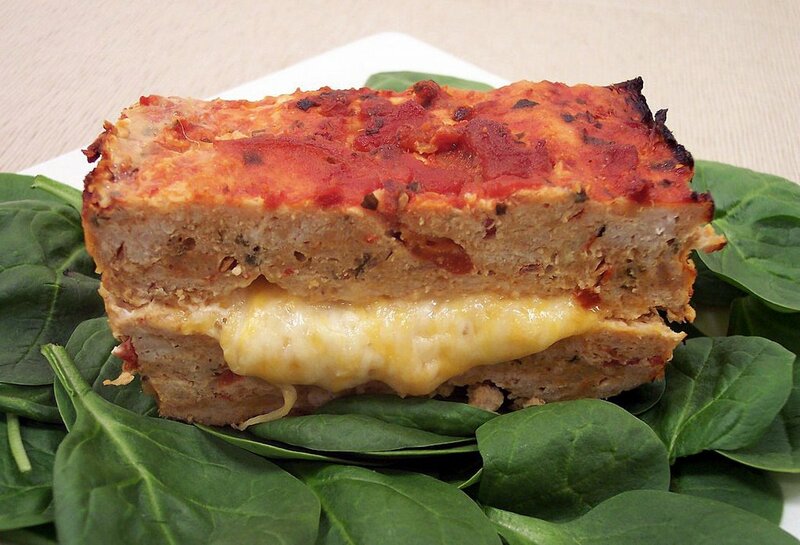 Santa Fe Meat Loaf starts out with a combination of ground turkey breast and 7% fat ground turkey. While you could use all breast meat, it may end up being a bit drier if you didn't have the extra fat from the mixed ground turkey. Roasted red bell peppers are sautéd with garlic, onions, and some smokey spices, that when cooled are mixed with the meat. This layered dish has a gooey center from a blended mix of mozzarella, cheddar and monterey jack cheese. To help moisten the meat and for a hot glaze on top, I used a spicy chipotle salsa - but if you want to tame it down, feel free to use a more mild version. Even though there are 6 crumbled bacon slices inside, I felt the flavor from them was lost since it was quite spicy and cheesy. I think the chili powder and cumin brought enough smoky flavor that I would just leave out the bacon next time. Eating for One is having a meatloaf blogging event during the month of March - make sure to check it out! Busy week! We made 11 new recipes... a pretty successful week with a few sweet stand-outs. 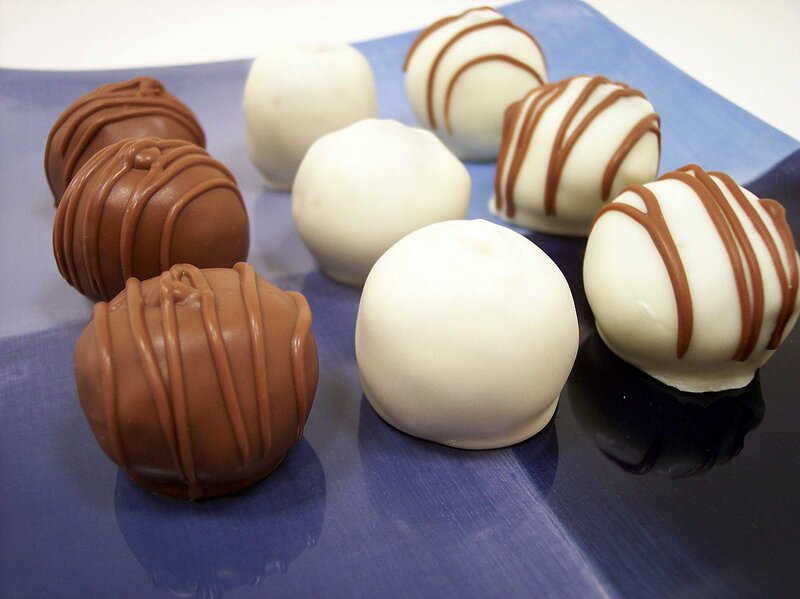 The Oreo Truffle Balls, Ricotta-Cheese Cookies and Easter Biscotti trumped the savory dishes for this past week's favorite recipes. Here's a small peak at one of the items we will be making this week. 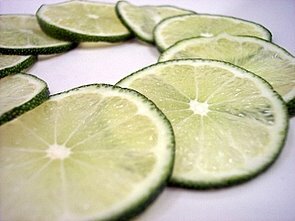 The response to the Creamy Key Lime Bars has been pretty good, so we're keeping with the Lime theme and will be using the larger variety to make cookies! The weekend movie tonight from Netflix will be Must Love Dogs starring Diane Lane and John Cusack. We have quite the variety of dishes coming up this week, so I'm excited to get cookin'. Come back and see what we will be serving from the kitchen next! 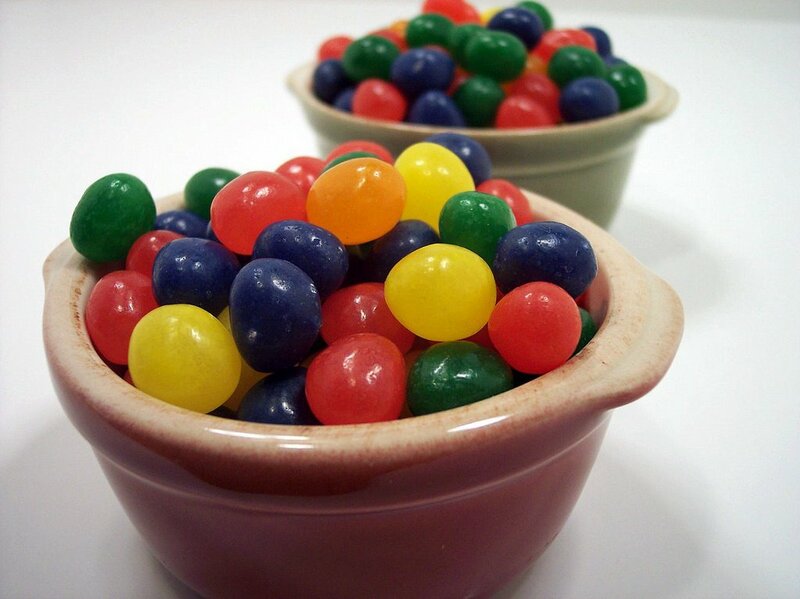 I mentioned last Sunday that I would be using some Jelly Beans to try out a recipe for the upcoming holiday. I'm pretty happy with the results and it was pretty fun to eat! 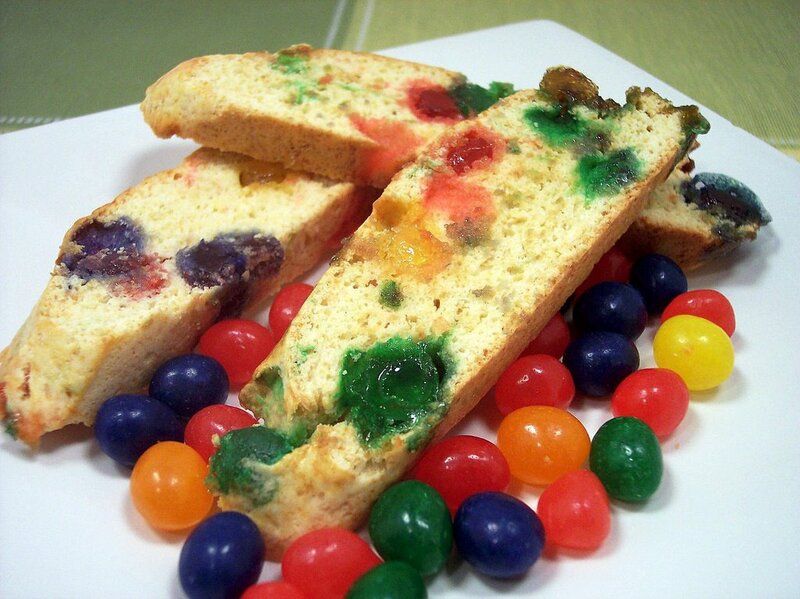 Easter always leaves us with leftover Jelly Beans, so this will be a nice way to get some of them used up! The recipe, Easter Biscotti, ends up being not as hard and crunchy as other biscotti recipes we make because the base includes some butter. In our other recipes, egg and vanilla are the only things added to bind the dough together so you end up with a crumbly base. In this version, I found the dough to be a bit sticker and a little harder to work with, but once it was on the baking sheet and using wet fingers, it was easier to work with. I used Jelly Beans that had 5 or 6 different fruit flavors instead of ones that have some pretty crazy concoctions. The biscotti does still have a crunch, but the inside is a bit more tender. Each bite contained a different flavor which was odd at first, but it was pretty addicting! The first log I let cool for about 5 minutes before cutting, as I do with all biscotti, but I found you have to let these cool at least 10-20 minutes. If cut too early, you end up having problems with the candy being to warm and it sticks to the knife or pulls out of the cookie. Tonight's Netflix DVD will be Fantastic Four with Jessica Alba and Chris Evans. After dinner, I will be sorting through the recipe piles to see what we can find to make this week. I have not added much to the pile in the past couple weeks, so it is nice to see it go down for a change! Stay tuned! A lot of the recipes we do end up using quite a few pots and pans, making for lots of clean up afterwards. I love making dinners that use one pot or pan to cook everything in order to help speed things along. Tonight's dish, Skillet Paella, filled our 10" pan to the brim by the time it was done cooking. There was no concern that it was going to bubble over, but this recipe makes quite a lot! Basmati rice is the bulk of the dish, accompanied by lots of juicy chicken bites, spinach, corn, roasted red bell peppers and shrimp. Saffron threads lend a rich color and impart a subtle earthy background to the liquid the rice soaks up. Dinner was served in just under 30 minutes which makes it a great weeknight dish without a ton of clean up. I portioned this out into 4 servings, but this could easily be stretched to 6 or so as four was very filling on its own. Cookies cookies cookies... so many different types, yet so little time to try them all! We usually prefer a cookie that is chewy/crisp, but every so often it is nice to have a change of pace and try a different textured one. 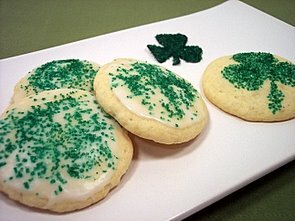 Have you ever had one of the soft, moist, melt in your mouth cookies that are usually found frosted with buttercream? That is how I could best describe the texture of these Ricotta-Cheese cookies. Yes, you read that right - Ricotta! I had to show Jeff the empty ricotta container as he refuses to admit that he likes it. They are cake-like, flavored with vanilla and almond extract to give them a boost in flavor, and frosted with a simple almond flavored icing. I didn't have time to make some buttercream, but that would be an excellent addition to these cookies. I sprinkled some green sanding sugar on top to dress them up a bit. I played around with the size - if you roll them in a ball they are a bit smaller, more thick and have a rounded dome when finished baking. If you flatten the dough balls, they are a bit larger which makes icing a little easier and they still puff up. Dinner tonight, Grilled Herbed Pork Tenderloin, is first marinated with the bold flavors of garlic, lemon zest, fresh sage and oregano, orange juice and orange honey. After sitting for a few hours, we used The Griddler to grill the tenderloin until it was just pink in the center. The juice and honey created a caramelized crust that mixed well with the more savory garlic and spice flavors. While this was so good on its own, it would be even better over a salad or in a sandwich. 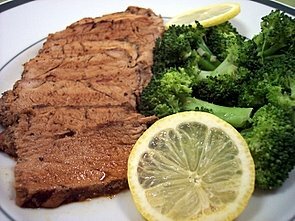 To have along side, I served Garlicky Lemon Broccoli. 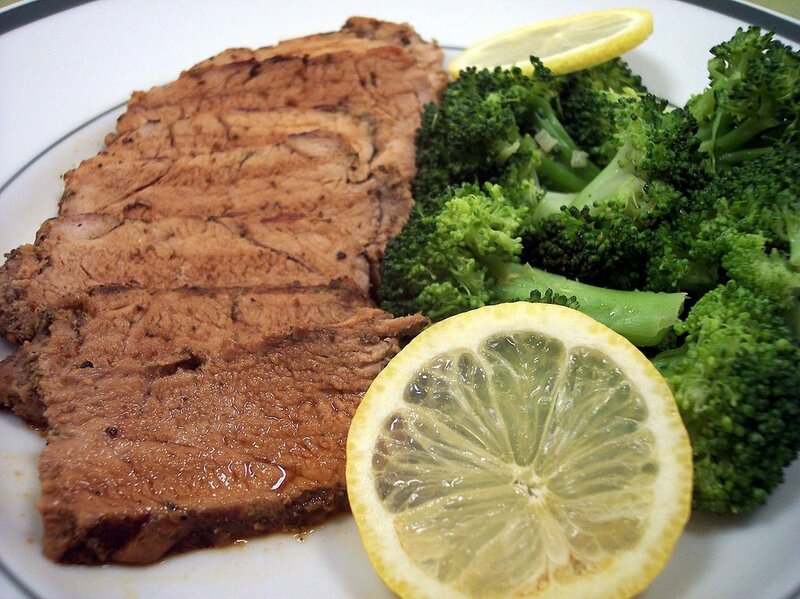 This recipe was incredibly simple and brought so much flavor to the broccoli. I was nervous that the garlic and lemon would overpower the simple broccoli, but the juice brought out the fresh flavor and the garlic gave just enough bite. I can see throwing this together often instead of just plain ol' steamed broccoli. The last loaf of bread I made was the Marbled Rye from a couple months ago. Since we finished the last of it from the freezer during the weekend I wanted to make some more today. 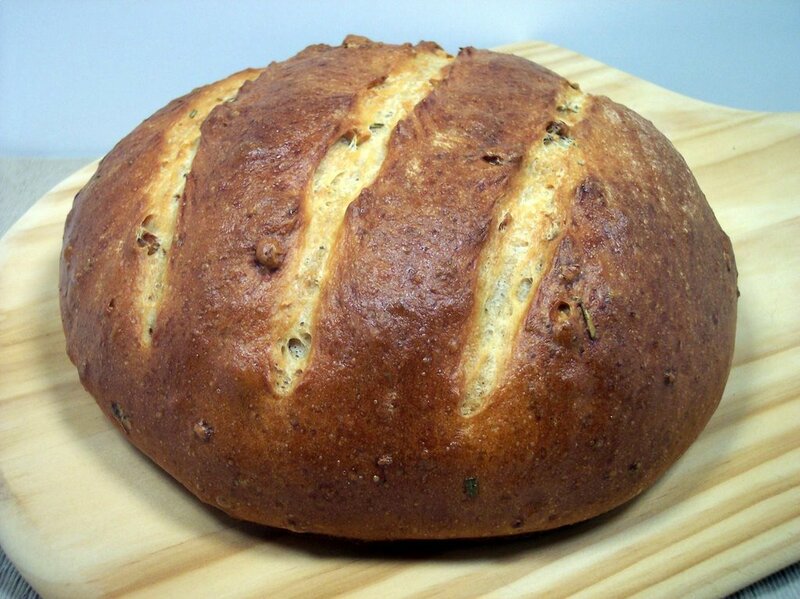 Walnut and Rosemary Loaves made two round loaves that take on a dark golden crust while baking. The dough was soft and a bit tacky, but the kneading process went pretty well. Since it has been so cold in the house, I used a trick I learned awhile ago to proof the bread. Leaving the oven light on in ours for a couple hours will bring the temperature inside to just under 85 degrees inside - which makes it a great place for the bread to rise. When I can't use that (like if I'm preheating the oven and it is on it's final rise) I like to wrap a heating pad with a towel and then set dough on top of that and cover it with a bowl - just make sure it does not get too warm. Right before these go into the oven, an egg wash is brushed over the top to aid in the color, then the top is slashed with a sharp knife. I did not get mine as deep as I wanted to because I got hung up on a couple of walnuts. The bread is chewy with a tight crumb and would be a great sandwich bread - the walnut and fresh rosemary flavors really shine through here. Here's another tip for the crust I used. While the oven is preheating, I also like to place a heavy duty baking sheet on the bottom rack and when I place the bread on the stone, I pour a bit of hot water onto the pan to create steam. You can use ice cubes, but I don't like how much it lowers the oven temperature - hot water works just as well and still makes a large amount of steam. 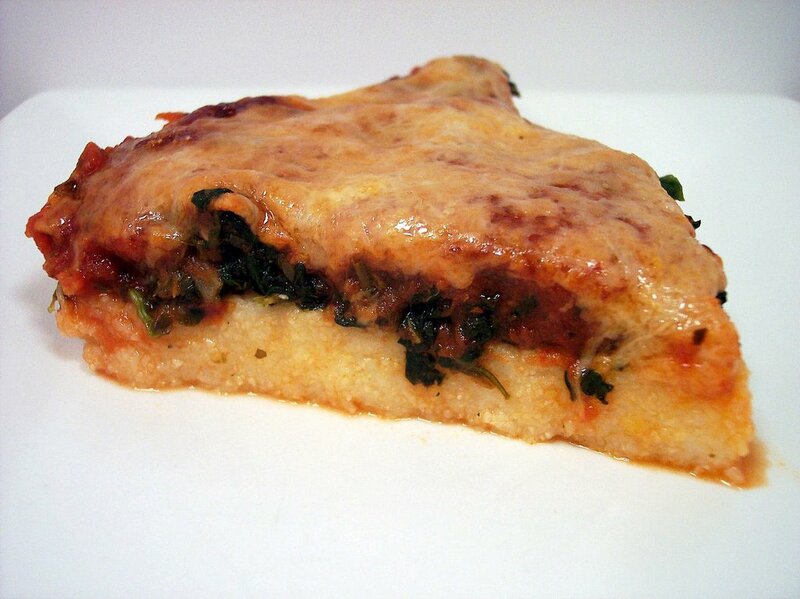 Tonight's dinner, Polenta Spinach Pie, was a fast recipe to prepare and bursting with flavor. I used white cornmeal instead of yellow (it is what I had on hand) to make the base. The polenta is layered with spinach, a chunky marinara sauce and freshly grated Parmesan cheese. 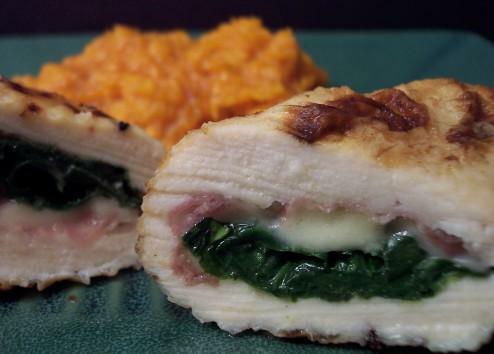 Baked until bubbly and golden this was a filling, healthy and a comforting dish. I liked how the textures between the firm polenta against a silky spinach and warm tomato-y top were enhanced by the strong Parmesan. Occasionally Jeff gets requests for things we have made for Wednesday Treat Days in the past that went over very well. He received one late last week and since I did not already have something planned out, I went ahead today and got them done to bring in tomorrow. I have made these Oreo Truffle Balls a few times before since they are pretty easy to make. They only consist of 3 ingredients - cream cheese, broken oreos and a coating of good quality chocolate. I like to keep the inside a little chunky, so I only thoroughly mix about one-half of the broken oreos in first. The second half is mixed just until combined, leaving some big pieces in for texture. I did not have as much white chocolate as I thought I did, so I had to melt down some bittersweet chocolate to finish dipping. 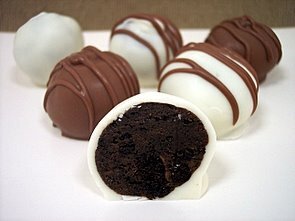 Since these need to stay refrigerated because of the cream cheese, you don't have to temper the chocolate, which can make it easier if you like - but if you have the extra time feel free to! It was pretty cold in the house today, so the chocolate set a bit faster than I wanted it to. This made them a bit more bumpy, but I kind of like "homely" look to them. It's hard to stop at just one with these! Tonight's dinner is similar to one we made a few weeks ago. 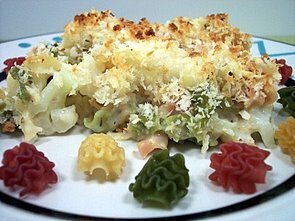 Cauliflower, Pasta, and Cheese Gratin is a bit different though since the recipe included Pasta, a combination of cheeses and a bit of dijon. I used a tricolor radiatore pasta from Trader Joes that is flavored with beets, red bell pepper and spinach. The flavor from the pasta was pretty masked by the creamy cheese sauce, but I felt it added to the overall taste. Sharp white chedder along with the salty parmesan was an excellent combination to the tender cauliflower. Panko breadcrumbs are mixed with melted butter to create a golden crunchy brown crust on top. I added some of the dry pasta so you could get a visual of what they looked like before cooking. We have made scones once before, but I've been wanting to try out another recipe. The technique is a bit different than the other one and I found the dough to be not as sticky this time. In fact, it was quite crumbly when you get to the stage to lighty knead it. 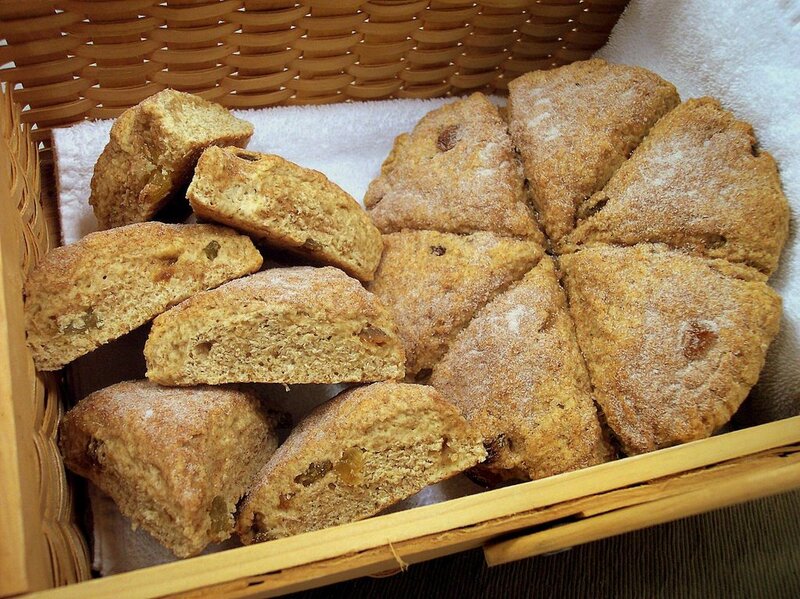 The golden brown crust on the Sour Cream Scones is crisp with a cinnamon sugar coating. When I split one open, I found the texture of the inside to be light and soft. The introduction of less than half whole wheat flour adds a nuttiness to the scone, without making it too heavy as if you used all whole wheat. These are not as rich like ones made with heavy cream, but I don't think I missed that much at all in these. I think this recipe could take on several different add-ins to replace the raisins if you don't like them. While these are tasty plain, you could fill them with some lemon curd, preserves, or clotted cream to dress them up. Tonight's dinner was pretty interesting. Asian Pasta Salad has an ingredient that I had to travel to a few different stores to find as I wanted to make sure I was using the correct one it called for. It calls for "Chinese noodles" and when I looked up the brand name they suggested (Ka-Me) the ones I found in the store looked nothing like it. I finally found what I think were the right ones the other day so I went ahead with the recipe. 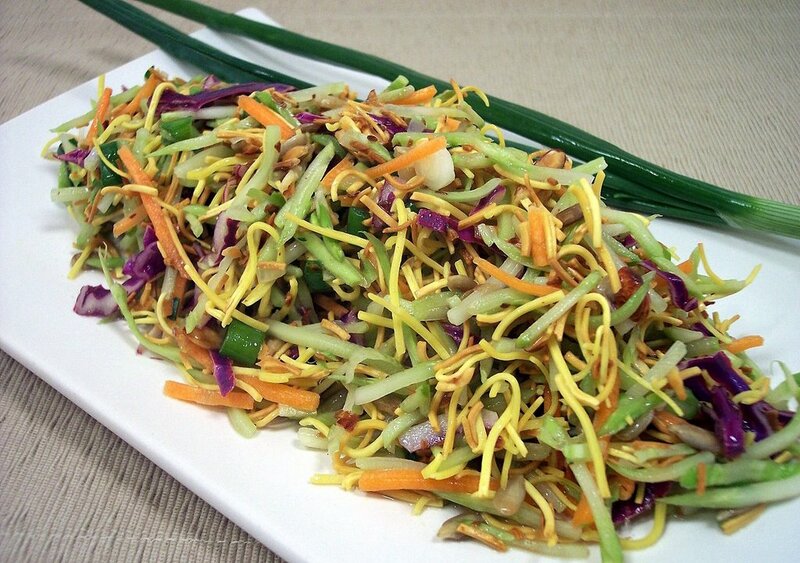 This would have been a great side dish to the Asian-Style Meat Loaves we had the other night. Instead of using the "angel slaw" it called for, I used a broccoli slaw that included broccoli, red cabbage and carrots. This is mixed with a toasted combination of raw sunflower seeds, sliced almonds and the crumbled dry noodles. A flavorful dressing is mixed in and everything sits for a few minutes to absorb. The noodles retain a bit of their crunchy texture, but soften just enough to be easily eaten - it kind of reminded us of like a firm ramen noodle. Different for us, but we were quite happy with the results - Jeff found himself saying "hmm, I'm going back for seconds!" 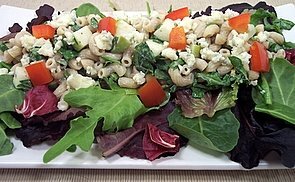 A total of 10 new recipes this week with the stand-outs for us being the Macaroni Salad with Gorgonzola and Whole Wheat-Date Bars. As you know, spring is quickly approaching and that means Easter is right around the corner. Later in the week I'm hoping to get an Easter-type recipe or two tested out to see if we will add them to the easter stuff we give out. Here's a peak at one of the things we end up with a plethora of during Easter - which I plan to use in a recipe. Netflix brings us the other weekend movie of The Adventures of Sharkboy & Lavagirl with David Arquette and Kristin Davis. I noticed it says "in 3-D" so I wonder if we will need the glasses to see anything special during the movie... Lots of new stuff planned again this week so once again we'll be quite busy in the kitchen. Stay tuned to see what we serve up next! It is 45 degrees outside, the windows are open and I'm sitting here in my long sleeve sweatshirt and long pants....why? 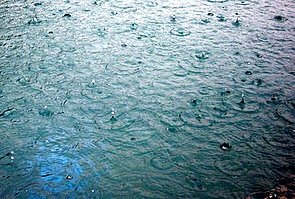 Because we are letting the sweet smell of fresh rain flow through the house as it cleans away the dust cloud of junk that has been over Phoenix. After 144 days without any, it finally started this morning at 1 am and has been on and off all day! And can you belive that 10 minutes away from us they had snow falling this morning! 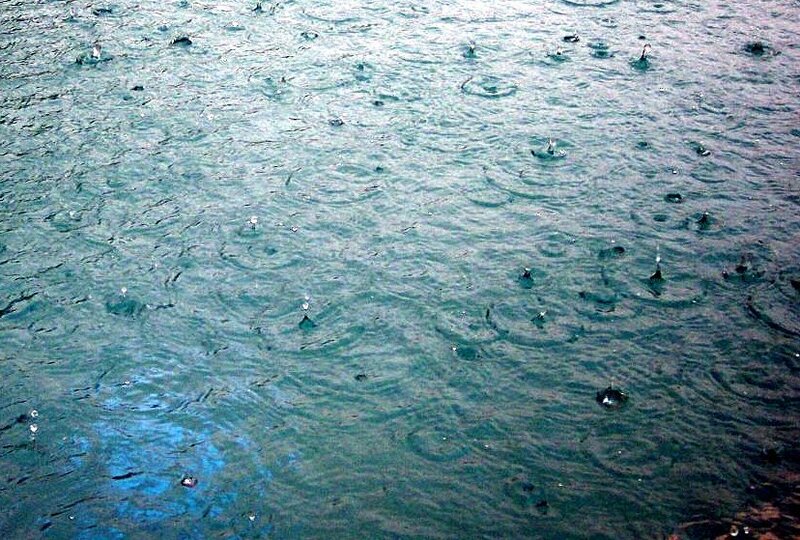 This is how the pool looked this morning. 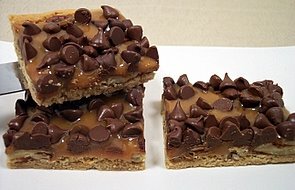 I've been in the mood to make something since I woke up this morning and today's new baked item is Monkey Bars. 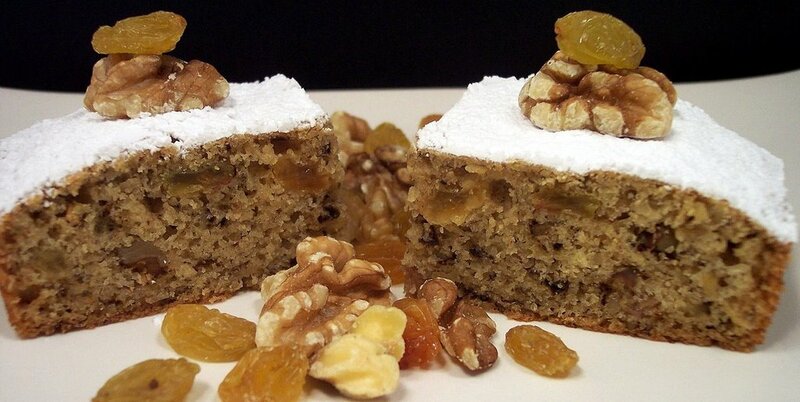 Think a moist banana bread, but baked in a snack bar form. Inside these bars are crunchy toasted walnuts and golden raisins that have been steeped in dark rum. The raisins burst with a dark, but tasty flavor when you bite into one. My banana was very ripe and the flavor definitely came through - so make sure to use a dark banana! When I have extras, I let them go very dark and then store them in the freezer. You can leave the skin on or off, but when I thaw them, I find it easier when the skin is on because you can just squeeze the banana out like toothpaste. A bit of sweetness is added on top by a dusting confectioners' sugar. With the rain today, it is a perfect night to watch a DVD from Netflix. The movie will be Fever Pitch with Drew Barrymore and Jimmy Fallon. I'm not too sure of the menu for next week, so I'll be spending some extra time reading through the to-try stacks and some cookbooks looking for some good stuff to try. Check back and see what we come up with! The recipe I made for dinner tonight is one I had set aside a couple months ago since Jeff really likes shrimp and this one looked very good. Today is our 7th year anniversary and I wanted to make a special treat since we don't have shrimp very often. Crunchy Shrimp with Toasted Couscous and Ginger-Orange Sauce has a long list of ingredients and instructions, but when broken down, much of it can be prepared ahead of time and assembled in a short amount of time. Couscous is quite easy to prepare - usually one would bring a liquid to a boil (water or broth) and the couscous is stirred in and allowed to sit for 5 minutes. With this recipe, whole wheat couscous is first toasted in a dry skillet to extract the nutty flavor. Then chicken broth and orange juice are poured in and brought to a boil. After sitting for 5 minutes, butter and toasted almonds are stirred in and kept warm until ready to serve. 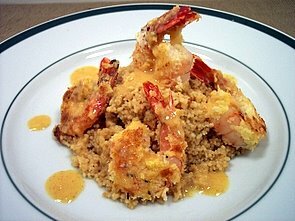 I found this to be a bit more "wet" that traditional couscous though, but not in a bad way. The shrimp have a crunchy coating of panko breadcrumbs mixed with fresh grated ginger to give it a bite. They are then seared off in olive oil until each side takes on a golden brown color. The sauce is a reduction of orange juice with a combination of spices to create a smooth, cool and citrus scented topping that could almost be eaten from a spoon. I can't wait to try and use it over chicken or fish. 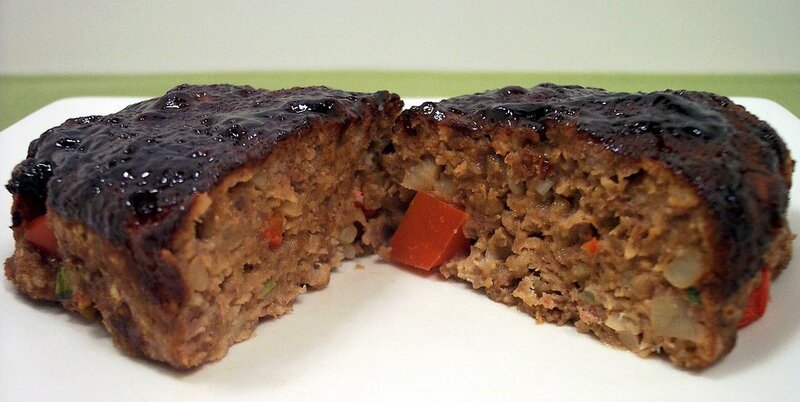 We have made individual meat loaves before, but tonight's version takes on an Asian twist. The recipes also uses another new-to-us ingredient - Water Chestnuts. In tonight's dinner of Asian-Style Meat Loaves, finely chopped plain rice crackers replace breadcrumbs that are typically used as binder. Mixing ground turkey breast with lean ground pork keeps the these mini loafs from drying out. Water chestnuts bring a crisp texture difference and have a very delicate sweet flavor. Instead of a tomato based product, hoisin sauce is included inside the mix and is also spread on top before baking to turn into a rich dark color. The hoisin also lends some spice and a bit of sweetness. Fresh ginger root also brings a bite to the dish. I served the Toasted Coconut Rice from Tuesday as a side. Tonight's dinner was technically a side dish, but there are lots of times that we just increase the servings a bit and turn it into a main meal instead. We usually do this when the recipe makes a fair amount, so by doing this we can still try the recipe instead of having a ton of leftovers. Macaroni Salad with Gorgonzola caught my attention as I would have never thought to include some of the ingredients together. The pasta I used was Barilla Plus and found the texture to be very palatable. I was surprised how much I liked the crisp and tart granny smith apples in the salad. Lots of different textures from the smooth dressing, crunchy walnuts and al dente pasta. Chopped arugula lends a peppery bite against the tang from the dressing. Crumbly rich gorgonzola is sprinkled on top and brings sharp bites of flavor throughout. To bulk the dish up a bit, I served it over a bed of tender baby greens. 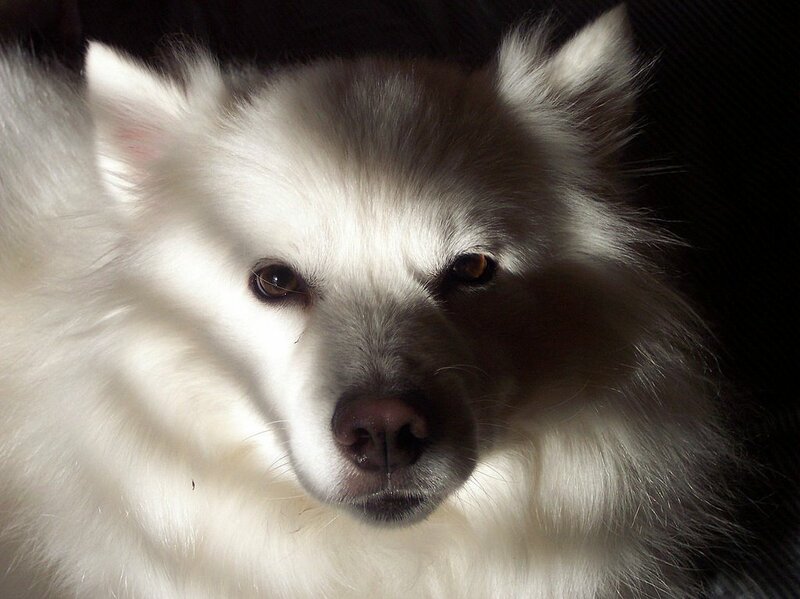 We had to snap a picture this morning when Max was just waking up and sitting infront of the blinds. He just looked so calm and ready to go back to bed! Somedays I only wish he was this mellow all the time! Does anyone plan on watching Top Chef tonight on Bravo? I have TiVO set up to record since it doesn't show until 12am here - hopefully it is a bit better than the other reality cooking shows. As you know, Tuesday is the day where I bake something for Jeff to bring into the office for Wednesday Treat Day. I went browsing through some cookbooks and magazines for something a bit different and gave Jeff a couple different options. He picked a good one to try! Whole Wheat-Date Bars requires some pre-planning as there are a couple steps where the dough needs to sit in the refrigerator for an extended amount of time. 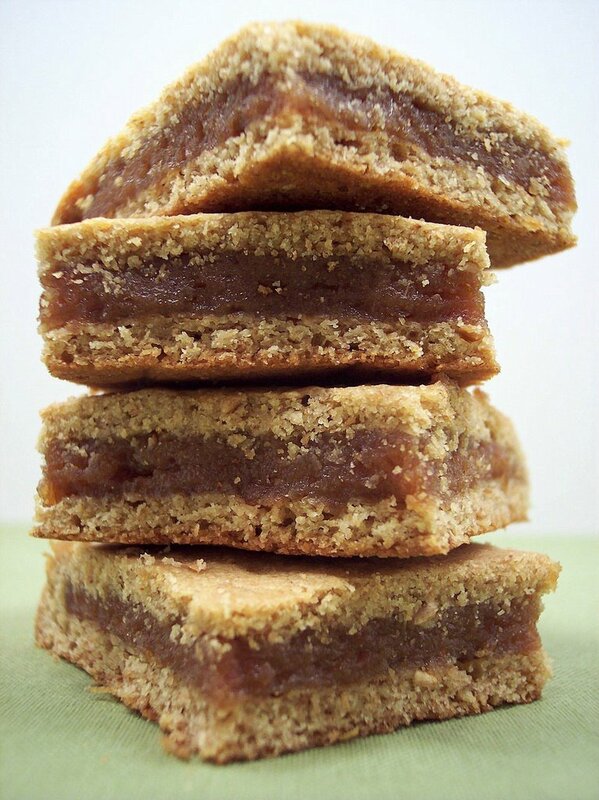 A combination of whole wheat flour and all-purpose flour form a cookie base over a smooth date filling. The dates are first softened in apple cider so they can be easily pureed in a food processor. 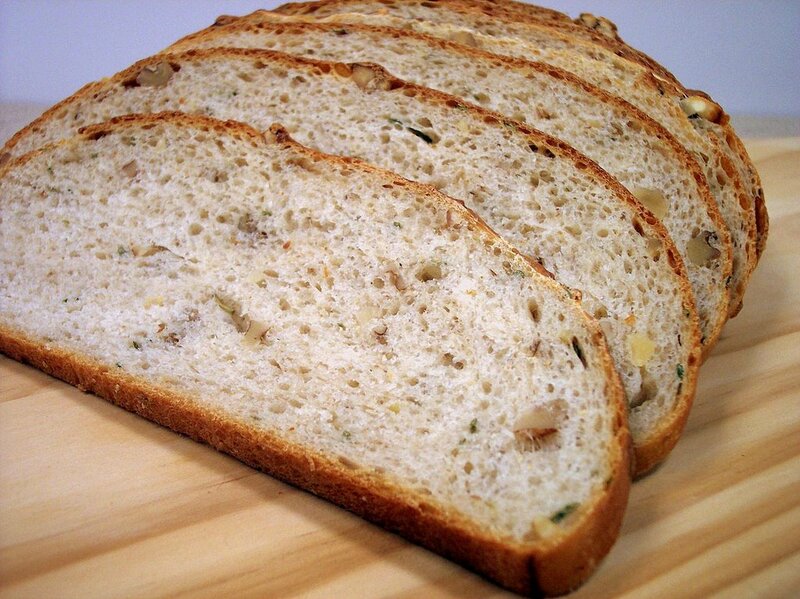 The crust has a hint of lemon, is nutty and firm enough to keep the filling from squishing out when you eat them. 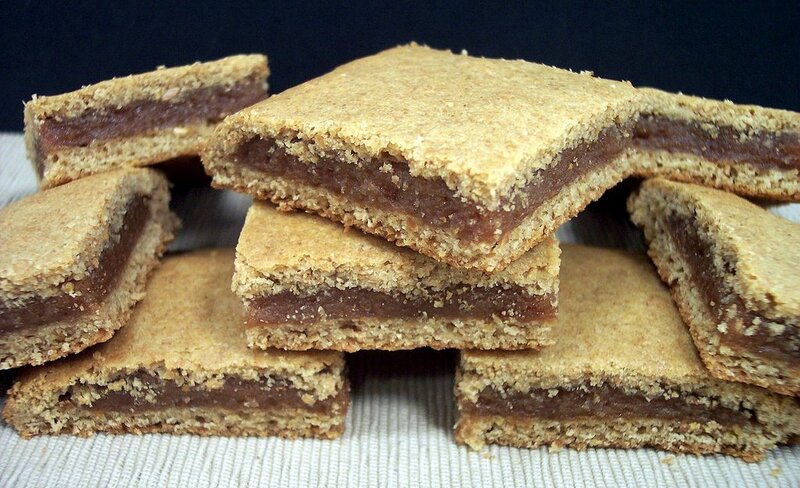 These bars have a wholesome taste but the sweetness from the dates balances the wheaty flavor. The side dish for dinner tonight was Toasted Coconut Rice. Cardamom is first toasted in a dry pan and then coconut is thrown in to get a bit of color. Garlic is then lightly browned in some olive oil, followed by the rice to allow it to toast before adding the liquid. The flavors are enhanced quite a bit which makes these extra steps worth it. Everything is mixed back in and allowed to simmer until the liquid is gone, creating a fluffy and slightly nutty dish. A bit of butter is thrown in with some cilantro at the end. We found the coconut to be not so pronounced, but fit in well as a background flavor. Very good. Wasabi and Panko-Crusted Pork with Gingered Soy Sauce was a perfect weeknight dish since it was pretty quick to throw together. The tender pork is encrusted with a simple panko coating and cooked until golden brown on both sides. If you find that the crust is browning too quickly, you can throw the pan in the oven to finish cooking the pork for a few minutes. To take advantage of the tasty bits on the bottom of the skillet, the heat is lowered and fresh ginger is added to the pan. Quickly followed by a mixture of chicken broth, sake, soy sauce, some sugar to balance the flavor and wasabi paste to punch up the spice. 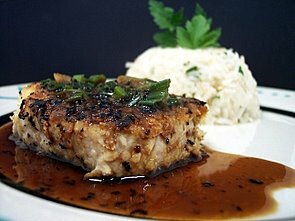 The sauce is finished with some green onions and spooned over the chops. Many new things coming from the kitchen! We had an interesting day in the kitchen today. 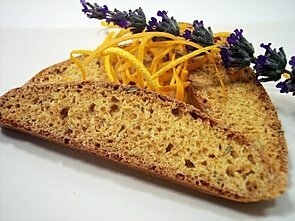 I made one recipe that I thought I never would end up doing, one that has a new combination of flavors and a new take on cornbread. Let's start off with the sweet and slightly savory combo. Curried Sunflower Brittle has a lot of promise, but I think the recipe could use some tweaking. Raw sunflower seeds and curry powder are first toasted (separately) and then mixed into a very hot sugar mixture. 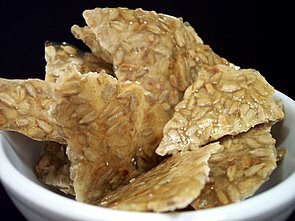 After spreading very thin and allowed to cool, you can easily break the brittle into shards. The recipe calls for cooking the sugar mixture for about 3 minutes, until you smell the first sign of caramel fragrance, but that is kind of hard to do when the air is filled with toasted curry powder. I let it go for about 4 minutes total, and while about half of it is crisp and firm, some of the mixture is a little chewy and sticks to your teeth. Other than the chewy texture, we both really loved the taste of this brittle. The brittle color is not as clear/see through because I used brown rice syrup in lieu of light corn syrup as we try to shy away from high fructose corn syrup when we can. The new take on cornbread tonight was Cheddar Corn Bread with Pepitas. This is a moist and more savory cornbread filled with sharp white cheddar, green chiles and topped off with crunchy pepitas. Since we have recently started using chiles in food, it seemed a bit too heavily chile-flavored , but the more we had I think we could have eaten the whole pan. Thankfully, we had something else to go with it tonight and only had a couple servings. 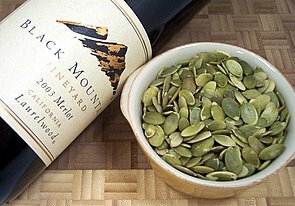 Peptias are raw pumpkin seeds with the shells removed and bring a great texture on top. Definitely worth looking for. 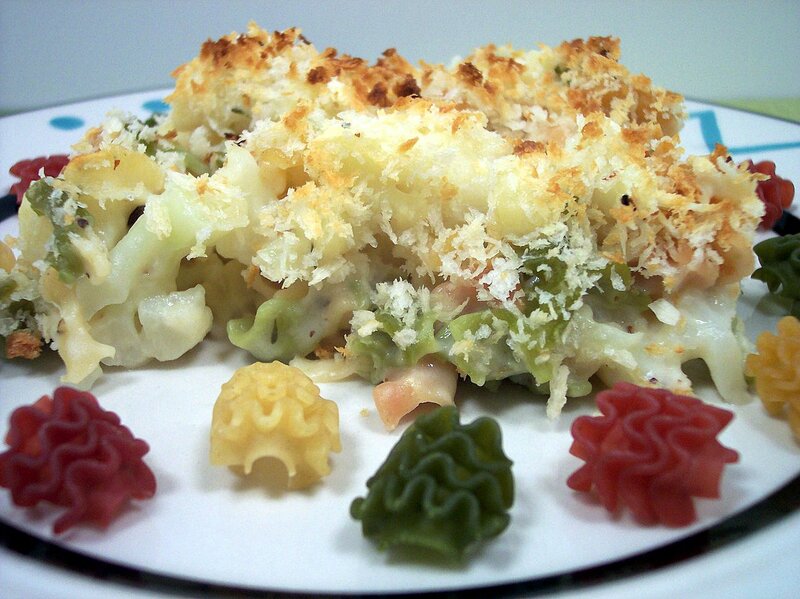 Okay, so the main portion of tonight's dish is something that I steered clear of while growing up. Whenever my family made this, I was no where to be found as just the sound of the stuff that went in it made me nauseous (yes, I was a really picky eater!) Jeff always said he didn't like it either so I figured we were safe, but I finally overcame my fear and went ahead with a recipe called All-American Chili. What's to be afraid of about chili right? Beans and other unknown stuff that even though I've never tasted when I was younger, I just knew I would never like it. Boy was I stupid for not even trying it a long time ago! We both thoroughly enjoyed this so much. Color me surprised! 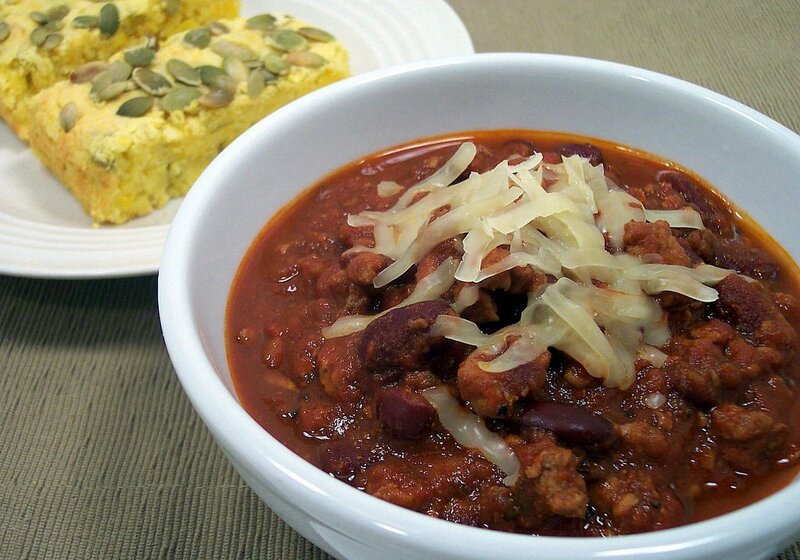 Thick, hearty and full of flavor with a bit of spice to heat things up. 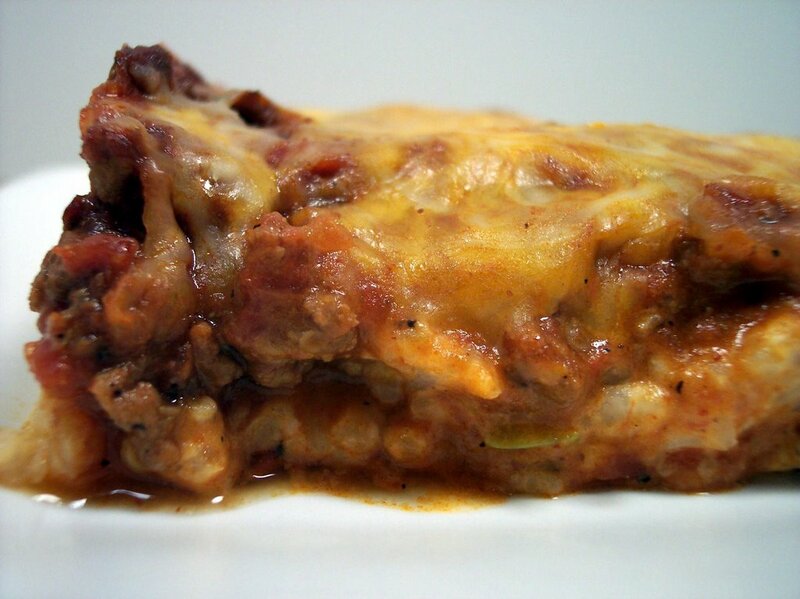 Even though the recipe uses lean Hot Italian turkey sausage and ground sirlion, they bring enough meaty flavor to make up for it. The recipe did originally call for brown sugar, but I set it aside until the end as I thought with all of the Merlot in the recipe it might not need it. When I tasted it as the timer was almost done, I'm glad I left it out. 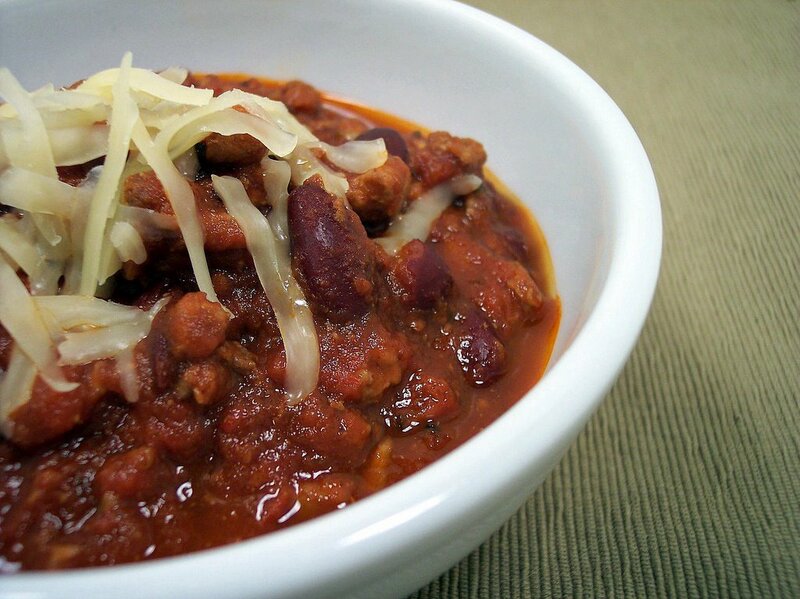 If you like your chili on the sweeter side, feel free to add in a couple tablespoons. This opens up so many other recipes we've skipped over because of certain ingredients we "thought" we would never like. We ended up with a total of 9 new recipes this week - a couple of stand-outs for us were the Peanut butter cake and Apple, Almond, and Mixed Greens Salad with Zinfandel-Cranberry Vinaigrette. This week brings a few new flavor combinations and even a couple of ingredients we have never used before. I'm excited and hope they turn out as good as they sound. Here's a peak at some pepitas and merlot that will be used in separate savory dishes for tomorrow night's dinner. We are really not wine drinkers and we were a little overwhelmed at Trader Joe's trying to pick out one to use for the recipe so I have no idea how this will end up! 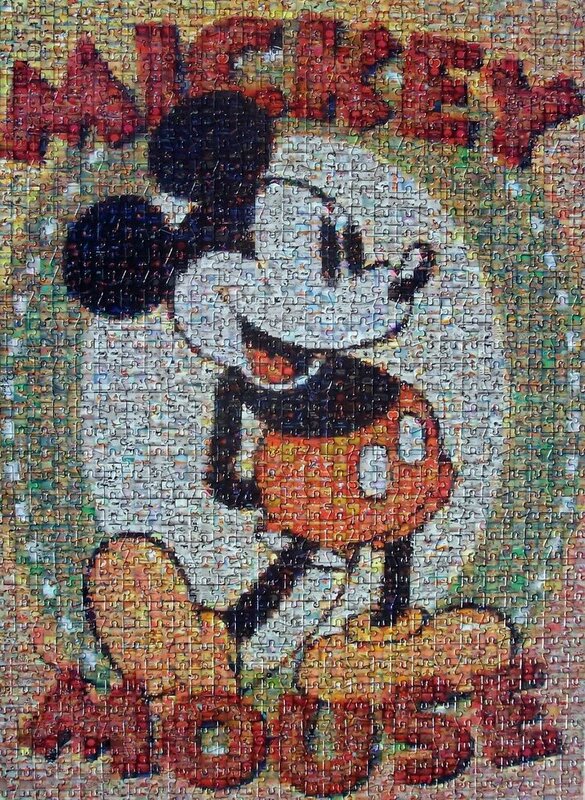 A couple months ago I mentioned we finished a Disney puzzle we were working on and that I had started another one. I got a chance to finish it a week ago and here's how it ended up. We are probably going to watch the Netflix selection of Wallace & Gromit in Three Amazing Adventures a little early this afternoon so we can watch the Academy Awards tonight. We had this in the queue before the DVD of Wallace & Gromit: Curse of the Were-Rabbit was released. Join me for a rain dance?